Q. Should I choose small speakers for a small room? In a small, broadly cubic room, it’s almost inevitable that there’ll be strong cancellation of bass signals from your speakers. Small but high-quality speakers (such as this Neumann KH120, with a five-inch woofer), used in combination with good headphones, are likely to be the best option in such a space. I finally have a spare bedroom into which I can put some studio gear. It’s strictly an amateur affair, with no need for the perfect setup, but I will notice even if nobody else does! I mainly work with metal, rock, and folk. The room is approximately 2.7 x 2.8 metres, with an awkward L-shape formed by a cupboard above stairs, and measures 2.35m floor to ceiling. The external walls are blockwork, and the internal ones timber-frame partitions.While I’d prefer to spend less, I could look at new or second-hand monitor speakers costing up to about £1000$1250. Assuming I’ve treated my room acoustically and sound leakage is not a concern, what size of monitors would it be worthwhile me considering? 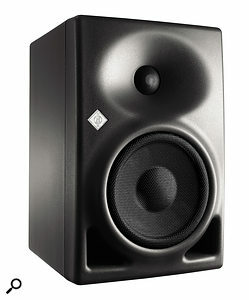 Needless to say, Id like them to be as large as possible, but considering the size of the room I’m wondering if anything greater than five-inch drivers will be a waste. SOS Technical Editor Hugh Robjohns replies: Your room is almost a perfect cube, which is the worst case from an acoustics standpoint, and there will doubtless be a noticeable lack of deep bass in the middle of the room where, inevitably, you will end up sitting.